Professor Marija Tir was born 1941 in Pivnice, attended primary school "Jan Cajak" in Backi Petrovac and grammar school "Jan Kolar" in Backi Petrovac. Graduated in Faculty of Philosophy in Novi Sad, graduation work: "Prilog proucavnja jezika Vuka Karadjica". 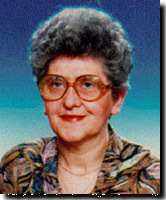 She works at school since 1963 and teaches subject Serbian Language and Literature.